Home / Static Shielding / What is a Faraday Cage? A Faraday Cage is any assemblage that utilizes conductive materials so that the inner and outer surfaces of a container cannot transmit electrostatic discharges (ESD) between each other. The principle is at work when lightning strikes the lightning rod of a building and travels to the ground so that it does not strike the people or the electronics inside the building. 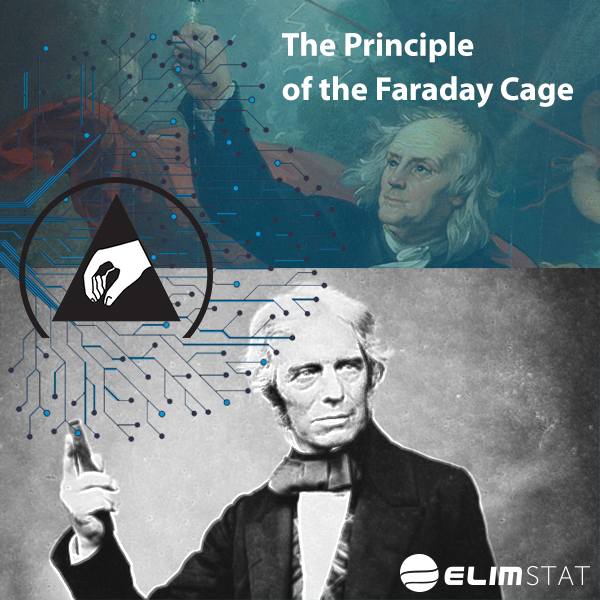 The principle of the “Faraday Cage” is based on the 1843 “Ice Pail Experiment” by Michael Faraday. At this time, Faraday was interested in how electromagnetic fields were created. Faraday believed correctly, contrary to popular opinion at this time, that there were not many types of electricity, but instead that the changing values of current and voltage produce different groups of phenomena. In the “Ice Pail Experiment” he lowered a positively charged ball into an electrically isolated conducting metal ice pail. (It was isolated by being placed on top of a wooden stool. Wood is an inductor.) Through electrostatic induction, the positive charge on the ball (without touching the ice pail) was transmitted from the ball to the outer surface of the ice pail. This proved electrostatic induction. In the ice pail experiment, a charged ball is lowered into an ice pail isolated from ground by sitting on a wooden stool. Charge is then recorded on the surface of the ice pail. What happens is that the negative and positive electrons inside the ice pail’s conducting metal separate: the negative electrons move to the inside of the ice pail towards the positive charge, and the positive electrons move to the outside surface of the ice pail. Next, Faraday discharged the electrostatic energy from the ball to the ice pail by touching it to the ice pail. Then he removed the ball. There was no charge recorded on the ball, but the positive charge still existed on the exterior of the ice pail. This proved that charges only exist on the exterior of a charged conductor. The corollary for the principle of the Faraday Cage is that the charge has no influence on anything enclosed within the conductor. Static Shielding Bags are static dissipative on their outer and inner touching layers but contain an aluminum layer sandwiched between these layers to stop ESD. Aluminum is conductive and is what stops electrostatic discharges (ESD) from entering the bag. Since the bag could hold a charge, it is best practice to place the bag on an anti static mat that is grounded for several seconds before handling the contents of the bag yourself. This gives any charge on the bag time to discharge to ground. ESD Smocks and Lab Coats are also considered “static shielding”. This is because they use black carbon threading sewn into a grid to stop static on our clothes and skin from breaching them and zapping electronics we may be near or handling. Again this comes with a caveat: the wearer of an ESD Garment must be grounded in order to not be an isolated floating conductor.